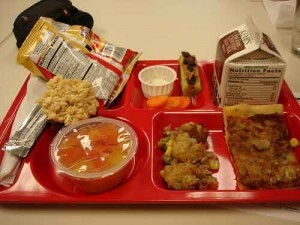 School lunches are not always the nutritional powerhouses that kids need. I remember hitting the a la carte line in high school and eating such nutritious items as nachos, a Rice Krispie Treat and a slushie for lunch. And this was supposed to get me through the day? Yikes. The Healthy, Hunger-Free Kids Act, which was signed in as law earlier this month, will not only allow the USDA to set nutritional guidelines for all foods sold at schools (hooray! ), but it will also increase the number of kids who qualify for free or reduced-costlunches. Because the only thing worse than subsisting on Rice Krispie Treats is a kid who isn’t eating at all.